"Tracks in the Snow" by Wong Herbert Yee -- Activity Packet! The librarian can be your best friend. They're awesome. They've got the latest books, they can steer you in the right direction in terms of reading levels and appropriate books. They can highlight new authors and stories. They're an SLP's dream! I can credit the finding of "Tracks in the Snow" to my lovely local librarian! It's an adorable book about a little girl who travels out in the snow to follow tracks in the snow. She goes through all the possible people/animals who could've left the tracks, when in the end she realizes it was her tracks leftover from playing the snow the day before! So cute! I decided to go a different way with this activity packet and integrate some history facts, as well as focus on language/speech. 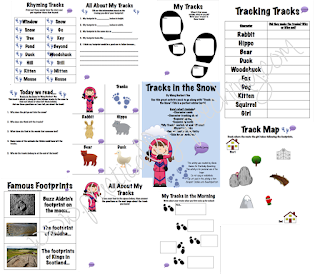 This packet allows you to sequence the "tracks" through a photo map, as well as track the tracks with a chart throughout the book! This is great way to teach note taking to students. Showing them how to "track" information while reading a story! I've also included character cards (as usual!) to help students sequence the characters in the story, as well as use the characters to retell the story! Now, "tracks" or "footprints" may be hard to explain, until a student sees it. This is why I've included the "All about my tracks" activity, where students will trace their own footprint, and then answer questions relating to their footprint. This can help explain how tracks are made! Rhyming is a huge portion of this book, as well as an important early language and reading tool. So, I've included a "rhyming tracks" activity using vocabulary from the book. Use these words to talk about why and how they rhyme. Discuss rhyme families, and other words that may rhyme with them! Download this fun and functional activity HERE on TpT! Happy tracking!